On December 5, a new version of AirMore has been released. This update added an amazing feature – Reflector. It allows you to display your phone screen on AirMore Web fluently. In this way, you can demonstrate what is happening to your phone on your computer without any delay! There are so many benefits you can get from this function. For instance, you can watch movies which are downloaded in your phone on a bigger computer screen. Or you can enjoy mobile games from PC screen, thus having a better visual experience. The best part is that you don’t need to root your Android. But do note that it requires that your device is running Android 5.0 and above. To use this function, just click “Reflector” icon on AirMore Web and follow the guidance. You’ll like it! Rating: 4.4 / 5 (based on 17 ratings) Thanks for your rating! Hi, thank you for your suggestions. We will see if we can add the mentioned features. Thank you! Is there a way to cast sound with this option? for me it plays on the phone and not the PC. Sorry. For now, AirMore doesn't have this function yet. But you can use this Android Recorder. Is there any way you can add some quality options? I'm looking to mirror my phone games to my PC, but my upload speed is pretty terrible. Lowering the streaming quality would help a lot. Actually on second thought, it doesn't seem to my internet. Whenever I go into VR mode it works fine for about 3 seconds then freezes. Everything else works fine. 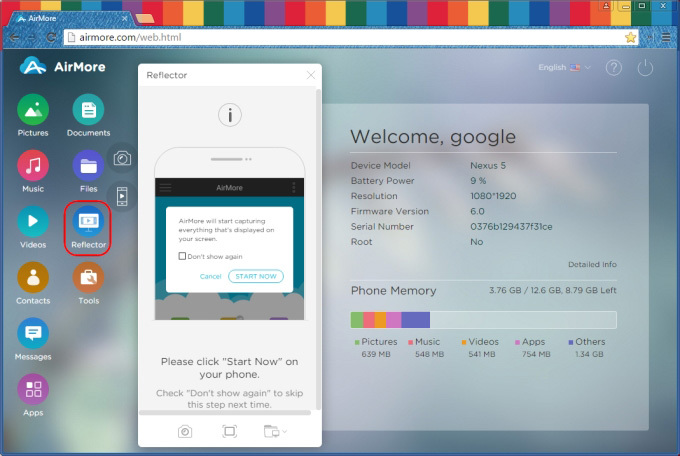 Are you planning to add the Reflector functionality for iOS devices too? Thank you for your interest. For now, probably not. But you can read this article to learn how to stream iPhone to PC using a nice tool.